Last night, 22 year old Cory Hubbard was crossing the street in College Park Maryland when he was struck by a car and killed. The driver is yet to be caught. Let's try and identify the car. 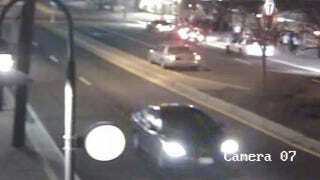 The car that is being sought has been described as a dark colored sedan. It is believed that it would have front end damage. The sedan is at the bottom of the photo above. Per the local Fox affiliate, if you recognize the vehicle, you're asked to call Prince George's County Police investigators at 301-731-4422, or Crime Stoppers at 1-866-411-TIPS. A cash reward is being offered in the case, and callers may remain anonymous.